USGS scientists are investigating the distribution of Florida manatees and their habitats and travel corridors in the northern GOM. Health assessments were performed on manatees known to travel to the northern GOM, and GPS tracking devices that provide telemetry to acquire fine-scale habitat use and movement were attached to the mammals. Scientists are also conducting field studies to characterize local resources in areas that support manatee habitat or consistent use. This information is being used to inform the risk of interactions between manatees and vessels traveling to and from oil and gas structures. The Gulf of Mexico Marine Assessment Program for Protected Species, or GoMMAPPS, is a multiagency partnership between BOEM, USFWS, NOAA, NOPP, and USGS with the goal of conducting broad-scale surveys of protected species to inform managers on the distribution and abundance of marine animals across seasons and years. USGS is leading efforts to provide information to GoMMAPPS on abundance, distribution, and movement patterns of sea turtles and seabirds. Some of the largest gaps in knowledge of marine turtle and seabird ecology occur in areas of heavy oil and gas use, including BOEM’s GOM Central and Western Planning Areas. Information generated by the USGS and its GoMMAPPS partners can be used in support of various BOEM/BSEE activities, including oil spill risk analysis, decommissioning of oil platforms, and movements of vessels. Oil and gas development and transportation activities are major components of Alaska’s economy, and some of these activities occur along Alaska’s coasts. The USGS is engaged in a collaborative marine monitoring program, Gulf Watch Alaska, which documents the status, variation over time, and underlying drivers of change in Alaska’s coastal marine ecosystems. This work quantifies the abundance, distribution, and change in hundreds of marine species, including many of high interest to management agencies. 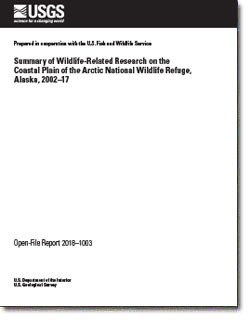 The USGS has been heavily involved in studies documenting the effects of the 1989 Exxon Valdez oil spill on the recovery of the wildlife population. This work provides a context for understanding the potential response of marine ecosystems to energy development relative to other sources of change. USGS scientists are characterizing change in the abundance, distribution, and health of polar bears relative to human activities in the Arctic. These studies emphasize the identification of critical habitats potentially at risk of disturbance from industrial activities along Alaska’s arctic coast. This work has informed efforts of U.S. Department of the Interior (DOI) agencies and industry when considering the consequences of oil spills and exposures to pollutants and actions to mitigate such occurrences. 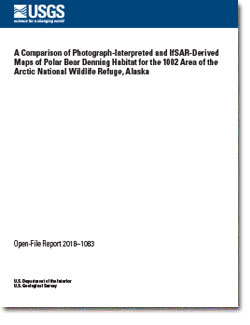 The USGS continues to work closely with DOI and industry partners to identify circumstances in which industrial activities likely adversely affect polar bears. Future work is expected to focus on the potential for resource development activities on land and offshore to directly and indirectly benefit polar bear behavior and health. As habitat loss and fragmentation increase across ungulate ranges, identifying and prioritizing migration routes for land-use planning and conservation has taken on a new urgency. Research attention is currently focused on determining whether continued energy development will lead to the loss of the foraging benefit of migration. USGS research in Wyoming has advanced our understanding of the importance of migration for large ungulates in the West, specifically quantifying how migrating animals track spring green-up during migration, a behavior termed “surfing the green wave.” Research on corridors in which migrating animals interact with housing and energy development suggests that the resulting behavioral modifications can alter optimal foraging. In collaboration with Federal, State, and university partners, USGS has developed the Migration Mapper software that provides a step-by-step analysis to map migration corridors from the underlying GPS locations. Resulting corridor maps can easily be made available for managers, policymakers, land trusts, sportsmen’s groups, and other NGOs to use in conservation planning. A current effort is underway, through USGS-led regional workshops, to train wildlife managers from Western States to analyze migration data, and USGS continues to develop tools and methods necessary to identify opportunities to enhance conservation and management of ungulate migration corridors. To better understand how oil and gas development affects big game hunting, USGS scientists examined the influence of oil and gas development density on harvest efficiency within all hunting areas in Wyoming from 2008 to 2014 for three big-game species: elk, mule deer, and pronghorn. The presence of oil and gas wells had a positive influence on harvest efficiency for elk and mule deer. Although there was no overall effect to pronghorn, there was a negative influence of wells on juvenile pronghorn harvest efficiency. Changes in harvest efficiency due to expanding oil and gas development could alter the amount of time hunters spend hunting and their chances of harvesting an animal, which could have subsequent impacts on hunter satisfaction, game populations, and economic revenue generated by recreational hunters. Pygmy rabbits rely on sagebrush for both food and cover year-round and are sensitive to oil and gas development. Pygmy rabbits are a species of conservation concern in several States. In Wyoming, USGS scientists are investigating the influence of oil and gas development on pygmy rabbit populations. This research can help determine the distribution of pygmy rabbit habitat relative to ongoing oil and gas well development and how far from the nearest well pad, road, or pipelines pygmy rabbit presence and abundance may be affected. The scientists anticipate expanding this work to other States where pygmy rabbits and energy development co-occur. This information can help inform the development of future oil and gas fields and reduce the effects of disturbance on pygmy rabbits and other sagebrush obligate wildlife. A large segment of the Florida manatee population uses warm-water effluents of coastal powerplants as a winter refuge. The power industry in Florida is working with USFWS and USGS in support of manatee research and protection measures as it upgrades powerplant operations and reduces warm-water effluents year-round. USGS scientists are developing models that estimate manatee survival and movement of individuals among warm-water sites. These models can be used by USFWS and industry to inform implementation of the warm-water action plan. The Southern California Bight and the Pacific OCS biome off the central coast of California support a diverse assemblage of marine birds and mammals. This area supports substantial global populations of several species, including black storm-petrel, brown pelican, Scripps’s murrelet, elegant tern, and approximately half of the world population of endemic ashy storm-petrels. USGS scientists are conducting aerial surveys and developing new techniques to provide updated status and distribution of seabirds and marine mammals in areas where renewable energy projects may be proposed and relate this updated information to past surveys. Recent publications related to mammals are listed below. Middleton, Arthur D.; Merkle, Jerod A.; McWhirter, Douglas E.; Cook, John G.; Cook, Rachel C.; White, P.J. ; Kauffman, Matthew J.
Courtemanch, Alyson B.; Kauffman, Matthew J.; Kilpatrick, Steve; Dewey, Sarah R.
Courtemanch, A. B., M. J. Kauffman, S. Kilpatrick, and S. R. Dewey. 2017. Alternative foraging strategies enable a mountain ungulate to persist after migration loss. Ecosphere 8(6):e01855. Aikens, Ellen O.; Kauffman, Matthew J.; Merkle, Jerod A.; Dwinnell, Samantha P.H. ; Fralick, Gary L.; Monteith, Kevin L.
Aikens, E. O., Kauffman, M. J., Merkle, J. A., Dwinnell, S. P. H., Fralick, G. L. and Monteith, K. L. (2017), The greenscape shapes surfing of resource waves in a large migratory herbivore. Ecol Lett, 20: 741–750. Sawyer, Hall; Middleton, Arthur D.; Hayes, Matthew M.; Kauffman, Matthew J.; Monteith, Kevin L.
Sawyer, H., A. D. Middleton, M. M. Hayes, M. J. Kauffman, and K. L. Monteith. 2016. The extra mile: Ungulate migration distance alters the use of seasonal range and exposure to anthropogenic risk. Ecosphere 7(10): e01534. Data and Tools related to mammals are listed below.